Acropolis View Dream Hostel is a nice and cozy Hostel located in one of the best areas of the city. We have a vast experience in the sector as well as a great knowledge about the city and combining both of the aforementioned elements, we are more than ready to offer a great service and ensure a fantastic experience with us. As it was mentioned before, our location is magnificent. From our facilities you can reach some of the best and finest attractions and landmarks of the city such as National Archaeological Museum, the National Garden and the Acropolis, amongst other important landmarks of our city. We offer several accommodation options that will suit the needs and wishes of diverse sort of guests and travellers. In this sense, we have dorms for four people with all the needs that the travellers need to get some rest after a long day of travelling, meanwhile for those people who are seeking for a more quiet stay we have private rooms ideal for couples or friends. - WHAT DO YOU GET AT ACROPOLIS VIEW DREAM HOSTEL? Acropolis View Dream Hostel is designed to make you feel comfortable like home. - In the kitchen you'll find everything you need to prepare your meals; coffee machine, boiler, smothie maker, herbs and spices and offcourse Extra Virgin Olive Oil. - In the dorm rest on the comfortable beds , store your luggage in the free giant locker with socket inside to keep safe and charge all your belongings, along with two plugs right next to your bed so you never run out of battery again. 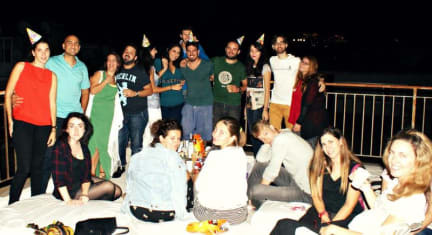 - On the roof, the heart of the hostel, you'll meet other travelers, rest on the big mattresses after a long day of sightseeing, while enjoying the amazing view of Acropolis and Lycabettous along with your favorite drinks. -Free Soft Towels and Bed Linens. -Free clean, bed linen and towels. We offer a great combination of party & chill where travellers from all over the world meet and exchange experiences. If you are a person who wants to make new friends, have a beer, enjoy the hostel atmosphere, enjoy Athens you are really welcome! Our success is based on the respect to others!!! Our staff, friends and family, work very hard to have a very respectful and peaceful vibe without the crazy drunken atmosphere offered at most other hostels. Our goal is to make you feel like at home and will provide you with a great social atmosphere, as well as giving you the opportunity to have a good sleep after a busy day of sightseeing the city. The reception service is open from 10.00 to 22.00. The latest check in can be done at 22.00 and then it is possible to do a check in up to 24.00 upon request and with an extra fee. Access to the common kitchen and some basic groceries is included in the price. Nevertheless, breakfast is not provided. One of the best hostels I've ever been to. L'ostello si trova in una posizione comoda e tranquilla e le camerate sono comode e dotate di condizionatore. La pulizia è scarsa e i servizi offerti sono minimi. Troppo caro per la qualità della struttura.